"As a student who came from an under privileged background, I found the need to be in this class. It’s not often that you are able, as a youth, to get the skills you need to become a better student, from someone who knows and understands the struggle. I was one of the few students who made it out of my home city and made it to one of the most prestigious schools in Florida. With this class, I quickly realized that I would be able to offer my service to students who needed it the most. In this program I had the opportunity over the course of the semester to teach my students skills that I’ve mastered, but more importantly improve my leadership skills as their mentor. It was challenging at first to randomly enter a child’s life in the middle of the school year and to try to connect with them on a personal level. I was a mentor who had the opportunity to mentor three girls who all had different stories and they all wanted to share them with me as soon they became comfortable. During that semester we based our relationship off of the “Seven Habits of Highly Effective People” book. The course strategically planned the semester out based around each habit. I would plan different activities that helped them learn and understand what each habit meant and to have them work on changing behaviors that would also help them understand...This class honestly was the most influential classes that I’ve ever taken, and as a result I request to continue volunteering. "C.A.M.P. Gator is a unique way to connect emerging leaders with the leaders of the following generation by creating an environment that encourages growth, hard work and success. The relationship that you have with your mentee is so rewarding and teaches you about leadership while making a lasting impact on your community." "I have gained a friend, and would definitely recommend this program to others. I actually think they should make C.A.M.P. Gator a graduation requirement. You learn so many things that cannot be taught in a classroom, and also gain a buddy. I plan on staying in touch with Nick in the future and want to remain a positive influence and leader in his life. This is thanks to C.A.M.P. Gator!" "This has been the most rewarding class I have ever taken in my life! From this class experience I was able to give to the community by changing at least one person’s life in a positive way... For the record, I have a feeling that all the other guys was trying to get in our group because of our hand shake! Just that little thing, like a crazy hand shake, turn either one of us from have a not so good day to feeling great because we had realized that we were there for each other! From the experience with working with Josh, I realized that being a leader and something that a person’s earn! Moreover, a good leader is one that will lead in a way that whom ever follows him will have no choice but to pursuit in doing what is right. With this said, from our first meeting walking into the library, I held the door open for everyone to get in and then I look up and there is Josh holding the other door! When he asked why is do that all the time I simply told him that it was being a gentleman, also and that anytime I can help someone out in need, ill do it in a heartbeat because no matter what I may think everything that I do does not go unnoticed and if you do good to and for others, good things will happen in return to you! In conclusion, C.A.M.P. Gator has been a huge success! From my hands on experience, not only did I reach my goal of changing one person’s life in a positive way but my mentee also taught me so much in return! Again, I would not trade this experience for anything in the world and I was just pleased and humbled to be a part of C.A.M.P. Gator!" "I think I found out more about myself while working with these kids than I did in my 4 years at UF combined... working with these kids has grounded me this semester and was the one thing that I have always look forward to." 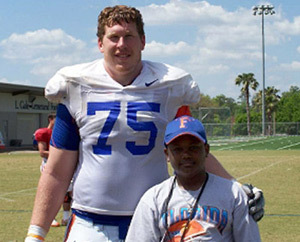 Being a contributing member of a national championship team at the University of Florida has cemented his legacy within the football program. However, the redshirt senior wants to leave lasting memories as a mentor as well. A Family, Youth and Community Sciences major, he is currently mentoring at C.A.M.P. 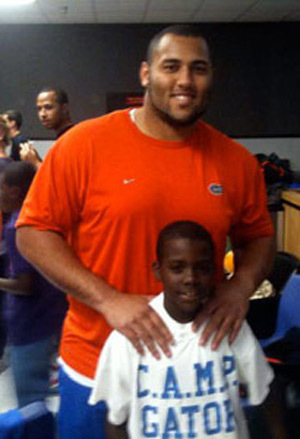 Gator and has been volunteering around the Gainesville community for the Goodwill Gators program throughout his time at Florida. The passion for working with children is far from a passing fancy. Sanders plans on having them be a major part of his future as he moves forward in life. "So, remember when I said that C.A.M.P. Gator has helped determine the direction of my life? Well, I'm taking the next step in C.A.M.P. Gator dreams. I'm joining the Teach for America Corp 2011! Congrats to my other fellow Gators who will be joining me this year. We're going to change the world!" "C.A.M.P. Gator has given our collegiate student leaders the chance to make a meaningful and lasting contribution in their community. The experiential curriculum allows mentors to develop their own skills as leaders while mentoring children who desperately need positive role models." "I have witnessed student UF students take ownership not only in the program, but in assisting the students they mentor. They are committed to seeing their students be successful. This has allowed the UF students to forge bonds with their mentees and has enabled them to personally grow as individuals, by helping others and sharing their personal experiences. The UF students are able to see problems or issues from a different perspective and that is helping them grow personally and become better people." 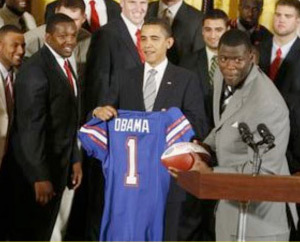 "Everybody wants to be a gator! What do gator UF students want to be – C.A.M.P. Gator participants! Three years ago, Matt Ohlson proposed, on the heels of the America Reads Initiative, a more interactive, hands on program that would assign a Gator UF student with a student in the Alachua County school system. The concept was not unique: assigning a UF student (as a role model) to mentor at risk students is a worn out, albeit good, concept that is oft-used, with success, throughout the college and professional ranks--every college and professional city has some hybrid program that uses the UF student's persona (UF student reputation and affiliation) to assist young kids who need help. indeed, these kids glean much from this experience. However, C.A.M.P. Gator is different. C.A.M.P. Gator has mutual reciprocity as its goal: The mentor gets as much, or even more, out of the relationship with the mentee than the mentee might actually get. in other words, the UF students, after a quality training program and a required 4 month experience with the student, actually reap greater benefits, (intrinsic rewards) than perhaps, the educational benefits and emotional support the mentee might gain from the experience. Indeed, my UF students who have participated in the program, and who have been separated from their mentee for over two years, will still remember their mentees name, the classes their student liked or didn't like and even the mentee's teachers- (the UF students don't even remember their own current class schedules--ha!). Most of my C.A.M.P. Gator UF students remain in contact with their mentee via email and even give their personal cell numbers to their mentee. I am not sure there exists an educational program in which the mentors are helped and rewarded more that than their students! perhaps, the most significant sign of how successful the C.A.M.P. Gator program has been is the number of my gator student UF students I have to turn away each semester because Matt doesn't have the resources to match everyone. Finally, I should mention that each UF student, upon graduation, must participate in a final evaluation of 'grading' their student experience at UF. It has been brought to my attention that a few student UF students have indicated that their most enjoyable experience at UF was not their educational experience or even competing as a UF student – they have mentioned that their semester doing C.A.M.P. 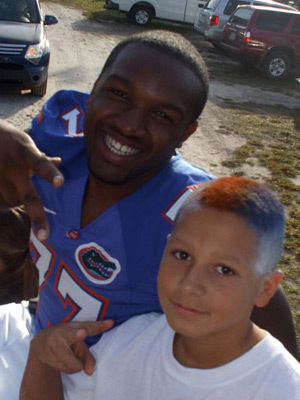 Gator was their most rewarding they have experienced at UF." 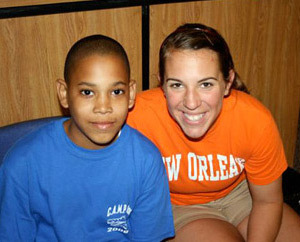 • YSA is pleased to present Grantee with a 2011 UnitedHealth HEROES Service-Learning Grant. • C.A.M.P. Gator has received The UnitedHealth HEROES Service-Learning Grant! Amanda McDonald, Grants Manager for Youth Service America, stated that she received many wonderful applications, but said that ours stood out as one of the best. • Received 2009 Work of Heart Award given annually to honor devoted volunteers for outstanding service in Alachua County. • C.A.M.P. Gator Program Coordinator and mentor Francesca Enea received Daily Point of Light Award for her outstanding service to the Gainesville community.